Best 3D Pen Reviews: From discovering the gravity to the movie Gravity, technology has certainly walked down a long, long way. And now the revolution has gifted us the 3D printing pens. Maybe many of you even have heard of the 3D printing, but this new 3D Pen technology is rapidly gaining popularity among artists and playing an instrumental role to unleash the creativity among them. what features you should check before buying a 3D printing pen and most importantly made up a list of the best 3D pens of 2016, so that you don’t have to rigorously search over the internet for the top 3D pens reviews 2019. But before we head toward the products, let’s find out what is a 3D printing pen and does it work. 3D pens also come with some added features like the Standby mode, OLED screen or the filament jamming detection system. So here is the list of the best 3D printing pens of 2016 and each of the devices in this list are unique by its own right and merit. So check out the list and pick the one which suits you the best. The first 3D pen which grabs the top spot in our best 3D Pen 2016 list is the 3d Simo Mini. This device is the most innovative and revolutionary 3D pen of the current era. But before we describe the device, lets shed some lights on this amazing 3D printing pen. The device first appeared in a kickstarter campaign to raise money for the project get going. Although many skeptics termed the 3D Simo mini as too innovative and too ambitious, the device was successful to grab loads of attention and eventually the desired financial backing. With the financial support it needed, the 3d Simo Mini has finally turned into the reality from an overly ambitious project. The device comes with some mind-blowing, top of the line features but the biggest advantage of this 3D pen is you can use it for multiple purposes apart from just 3D printing. The attachments get attached with pen through magnet and you can use all these attachments on various different materials such as metal, wood and other materials which are compatible and supposed to work with the 3D pen. Special Note: 3D Simo pen is the only 3D printing pen which comes with different modules and attachment and somewhat revolutionizes the concept of the 3D pen and the industry involving with it. The 3D Simo Mini pen also comes with an Android, iOS and Windows smartphone app so that the user can control some of the basic functionalities of the device through the apps. So if you are eager to know what can be controlled and what are not, you can choose profiles and watch the tutorial videos from the application. The 3D Simo Mini pen is very much pocket friendly. Comes with multipurpose attachments and filaments (PLA,ABS & Metal). People with prior 3D printing experiences or the newcomers, everybody can use the pen with ease. Build quality of the 3D Simo Mini is not up to the mark, considering the fact how awesome the device is. Although the pen is very easy to use, if you are a newcomer you will find it a little bit difficult to grasp all the technicalities. The second contender in our best 3D Printing Pen 2016 list is the Scribbler V3 3D pen, and going by the name you can anticipate that it is an upgraded version of the legacy Scribbler Pen. The Scribbler 3D printing pen has been ruling the market for a long time and the main reason of such popularity of the device is its amazing build quality and the superb ergonomic features, which make the pen very easy to use. The Scribbler V3 3D pen is available in 8 different colors and Green, Blue, Purple, White, Red, and Yellow are among them. Apart from the colors this highest selling 3D pen also comes with different colored filaments. As we have already discussed, the ergonomic features are the main reason why the pen is so much popular among the users. 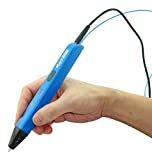 The Scribbler V3 3D printing pen is incredibly light weight and very easy to operate. Moreover, you don’t have to worry about changing the filaments, as can be done with ease. So, in a nutshell, the Scribbler V3 3D pen works in a very friendly manner which facilitates the user to operate the pen without any hassle. Although the Scribbler V3 3D pen is a brilliant device by its own merits, if you are used to with the traditional way of drawing with pen or pencil, you might find it a bit tough to grasp the technicalities of this 3D pen at first. After you get over the learning curve, you will find it an amazing device to use. It is arguably the best 3D Pen of 2016 according to some core experts. This 3D pen weighs only 2.6 oz. which is incredibly light compared to the other 3D Pens available in the market. The Scribbler V3 3D Printing Pen features a large OLED screen which enhances the usability. You can make drawings with this 3D pen on various types of surface. This 3D pen is very user-friendly and convenient to use. If you are a traditional artist, you might feel the Scribbler V3 3D Printing Pen a wee bulky and uneasy to use at first. 7TECH 3D Printing Pen has grabbed the 3rd spot in our top 3D Pen 2016 list and this particular 3D pen stresses on only one motto, to satisfy the users and to make the pen more user-friendly and easy to use in nature. This specific 3D pen comes with a hand full of features and the best part is the 7TECH 3D printing pen operates silently. As we have already mentioned, the 7TECH pen comes with some mind-blowing, advanced features such as the pen features one of the best thermal controls as well as notifies you about the filament getting stuck. A common issue: A common problem the users face while using a 3D printing pen is the super-slow or super-fast extrusion of the pen. But while using the 7TECH 3D pen you don’t have to worry about this as the device allows you to control the extrusion as per your own preferred speed. Special Note: If we talk about the downsides of the 7TECH 3D printing pen, the heating issue of the pen while being fully operational has bothered us a bit. While using the 3D pen, the temperature of the device can go incredibly high sometimes, which can cause damage to your skin to some extent, if you get in contact with it. Maybe the lack in numbers of filaments causes this heating issue. But having said that, 7TECH 3D Printing Pen is one of the best 3D pens available today and if you purchase it, you will not regret later. This 3D printing pen is very easy to use for both the veteran and newcomer artists. 7TECH Pen is slim and very light weight, which makes the device ergonomic and use to operate. This 3D pen features an advanced unclogging system which saves the filament from clogging after cooling down. The pen also comes with an aluminum spatula which protects user’s fingers from the hot nozzle. This Pen offers the users 1 year warranty which is an added bonus. As we stated earlier, the temperature can get very high when the device is operating fully. Lix has stunned the whole world when they launched the world’s smallest 3D pen. Their first 3D printing pen was not at all ‘small’ and the 3D pen market has not seen such a small device before. Thus the Lix 3D Smart Pen has been proved as a wonder gadget for both the critics and the buyers. This 3D pen was first introduced during Kickstarter campaign for its incredible features and unprecedented size, the gadget got the much required financial backing. So if we talk about the working procedure of the Lix 3D Smart Pen, the pen comes with a top notch build quality and performs superbly on almost every surface without any hiccups. Another brilliant feature of this best 3D pen is, it is one of the most quite 3D pens available on the market today. It can work in a complete pin drop silent environment, so you don’t have to disturb others while drawing your 3D painting. The Lix 3D Printing Pen is ergonomic, very easy to use as well very lightweight. The Lix 3D Smart Pen is incredibly stylized and extremely well built. Nothing we are aware of as of yet! Having a party at home, or like getting a lot of things done at the same time? The BLACK+DECKER GD2011B Family Sized Electric Griddle may be the best option for you. The heat distribution is great on this one, and you will not be left with hot or cold spots anywhere on the surface. This also helps you utilize the entirety of the surface fully. The next product on our best 3D Pen 2016 chart is the Lay3r 3D pen. Well if you are being skeptic about the name, we would only say “do not judge a book by its cover”. The Lay3r 3D printing pen is surprisingly amazing and may be the best 3D pen for the kids right now. So if you want to know why we are being so much excited about the device, check out below to know about the working procedure of the Lay3r 3D Enabled pen. Although this 3D printing pen is oddly large compared to the other available in the market, still the pen is very ergonomic, easy to handle and not all heavy. The Lay3r 3D pen is so much easy to use that even a 12-year old make drawings with this pen with proper guidance and instructions. So if you are newcomer or a veteran artist, you would fall in love with the Lay3r 3D printing pen once you will start using it. Another stunning feature of this specific 3D pen is it comes with a fan which ensures that the pen stays cool during the hot operating temperature. Moreover, the Lay3r 3D printing Smart pen facilitates the users with an automatic shutdown feature which turns off the device when the pen is not being operated. And if we have to talk about the downsides of the Lay3r 3D enabled pen the only thing we could think of is the bulky size of the gadget. But then again, considering the fact the pen comes with an in built fan, the size of the pen is totally justified. Very easy to handle, use and operate. Extremely well built quality. Comes with an inbuilt fan to cool the pen when it is fully operational. Offers the users a one year warranty. As the Lay3r 3D printing pen includes a fan, the size of the pen is odd and bulky. We are already halfway through the list, and the next device to grab the 6th place in our best 3D Pens 2016 chart is ccbetter Intelligent Pen. This 3D printing pen is also termed as the Joyluxy Intelligent 3D going by the maker’s name. Although the 3D pen does not flaunt any over the top features, it covers all the basic and necessary functions a 3D pen should have. The ccbetter Intelligent 3D printing pen comes in a sleek box similar to your usual smartphone box and the box contains the usual power brick and 2 supplied filaments. Special Note: Keep one thing in mind that you can always buy separate filaments of your own choice if you are not satisfied with the supplied filaments. Apart from the power brick and the filaments, you will also notice a stand which you can use to put your pen on when the device is not in use. The ccbetter Intelligent 3D pen can work on almost all the major materials & surfaces, and both the newcomers and the veteran artists can operate the pen with great ease. This 3D pen also features a small OLED screen which indicates the status of the pen as well as tells you the whether the filament is heated and ready to use or not. This is a great inclusion by the company and certainly makes the pen more user-friendly. There is no instruction manual! The only con we found out about this ccbetter Intelligent 3D is the lack of instruction guide. 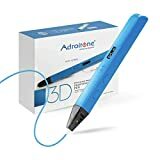 The pen does not come with a proper and detailed instruction manual and the people who are using the device for the very first time might feel a bit confusing and difficult to understand the 3D pen properly. Having said that, we will also say that the ccbetter Intelligent Pen from the house of Joyluxy is one of the best 3D pens of 2016, especially if you are looking for such a 3D pen which offers great value for money your product. This 3D pen is ergonomic in design and very easy to use. The ccbetter Intelligent 3D printing pen looks stylish and vibrant, unlike most of the top 3D pens of the market. The additional pen holder which comes with the box is a nice touch, especially for those who are bit clumsy with such devices. Lasso Labs, the company which is famous for making the GENESIS 3D printer, has also started designing 3D pens, and the product GENESIS 3D Printing Pen has grabbed the 7th spot in our best 3D pens 2016 list. 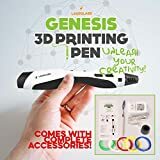 Unlike the Lix 3D printing pen, this 3D Smart pen is not all sleek or small, but when it comes to the functionalities, the GENESIS 3D Printing Pen can give other pens a run for their money. This 3D printing pen can perform on almost all materials & surfaces and does it smoothly. Moreover, the plastic filament of the pen does not get stuck and the chassis of the device does not get abnormally hot-like most of the contemporary 3D pens. Usually the GENESIS 3D Printing Pen comes with 5 filaments but you can always purchase the filaments of your choice, separately. Remember: The only complaints we have on this 3d pen is that the pen is a real deal for the small scale projects but when you are using it for a large project, the heating issues might appear. Very easy to use for both the newcomers and veteran artists. Amazing built quality. The company offers the users incredible warranty period, which is always an added bonus. The ergonomic design, portable construction and the light weight of the device make the pen more user-friendly. Just like the Lix 3D printing Smart pen, the CreoPop 3D Printing Pen has also revolutionized the concept of the 3D pen. This is the only cordless 3D pen available in the market today and thus ranked as the 8th best 3D pen of 2016 in our list. As we have mentioned already, this specific 3D pen does not require a wire to work and thus the pen offers an insane amount of portability to the users. Apart from being cordless in nature, the CreoPop 3D Printing Pen has another surprising feature up in its sleeve. Unlike most of the contemporary 3D pens, the CreoPop 3D Pen does not come with any heating parts. Yes it sounds a bit crazy, but this particular 3D enabled pen uses plastic without even heating and melting it. Almost all the popular 3D pen of the current era uses thermoplastics; whereas the CreoPop 3D Printing Pen uses photopolymers. Although the CreoPop 3D Printing Pen does not use the traditional thermoplastics ink, the pen performed extremely well in almost every surface. 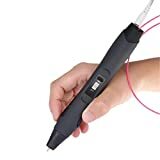 So if you are looking for a unique 3D pen which is fancy, easy to use yet futuristic, then the CreoPop 3D Printing Pen is the ultimate solution for you. And if we talk about the negative points of this 3D pen, we find absolutely nothing about this incredible 3D Smart pen. Comes with a top notch design and extremely well built. Futuristic, innovative and includes one of a kind feature. The objects produced through this 3D pen offers more long lasting freshness than the objects created by the other 3D pens. A bit fat and bulky in design. 3Doodler is the first company which came up with the idea of 3D printing pen and the latest 3D pen of the company, the 3Doodler 3D Printing Pen is surely one of the top 3D pens of 2016. Why we are being so excited about this specific 3D printing pen? The 3Doodler 3D Pen comes with 50, yes you have read it right, 50 plastic filaments and by far the most number of filaments a company is offering to its consumers. The 3Doodler 3D Printing Pen not only comes with a huge number of plastic filaments, but it is one of the best looking and stylish 3D pens available in the market right now. Another advantage of this device is the filaments are very easy to replace and do not get clogged. This 3D pen works perfectly on almost every surfaces and very user-friendly for both the veteran as well as newcomer artists. The sleek and innovative design of the pen, as well as the build quality is one of the finest compared to the other 3D printing pens. Comes with 50 plastic filaments, which is cherry on the top. Very easy to setup. Newcomers might feel a bit tough to understand the device for the initial couple of days. A 3D pen is nothing but a bulkier version of an ordinary pen or a pencil which uses plastic filaments instead of the traditional ink or lead which is used in pens or pencils. There are no differences in holding a traditional pen or pencil and a 3D printing pen, neither there are differences in the drawing mechanism. But the working procedure is certainly from each other. So now you all must be thinking how does a 3D printing pen work and what is its working procedure. We have explained that too, just dig in below. As we have stated earlier, the 3D printing pen uses a plastic filament instead of the traditional lead or ink. So first you have to insert the plastic filament and once its inside the 3D printing pen, it gets heated due to some heating technology included inside. The heat is strong enough to melt the plastic filaments and turn the filaments into liquid. These filaments come in various colors, so you can choose that specific colored filament you require, to complete your painting. The best part of a 3D printing pen is that it works on almost every surfaces and materials. Now if you are thinking what you can make out of a 3D printing pen, honestly the potentiality of this device is limitless and unparalleled. The drawings you usually make with a pen or pencil, they all are two dimensional. Whereas the 3D printing pen adds an extra dimension in your pictures and make it more realistic and eyegasmic. Although the 3D printing pens are relatively new on the market, the market has already been saturated. So that means there are hundreds of 3D printing pens are currently available in the market. So if you are a newcomer in this field you will find it tough to select the best 3D Pen for you. Thus we have made a features list below, which you might consider before you buy a 3d printing pen in 2019. So feel free to check all of these 3D Pen Reviews and consider this article as a buying guide. Control over the pen: The best 3D pens always provide the users a bit extra control over the device. Like some plastic 3D pens come with temperature control to help fine tune your drawings, some products let the user to control the speed of drawing for comfort and ease of drawing. So check the type of controls the 3D printing pen assures to provide before you buy one. Design: Ergonomic design is another prime feature you should check before you a 3D printing pen. The top rated 3D pens usually come in a small size and even allow the users to recharge through laptop USB. Design plays a crucial part and it should provide you easy controls on your hand and easy access to display. The ergonomic design also enhances the quality of a 3D pen and you should keep this point on your mind before buying such devices. Filament Type: As the filament is the main component of a 3D printing pen, you must check the filament type before buying a 3D pen. The filament types determine how easily you would hold the pen or which grip you would get. Currently, there are 4 main categories in filaments and they are Standard, Flexible, Composite, and Specialty. Brand Reliability: As the 3D pen technology is relatively new, the brand name plays a crucial role before you set your mind to buy such a device. 3Doodler first came up with idea of a 3D pen, where as Scribbler offers their customers a 1 year or 6-months warranty. Brands like Lix are on the other hand, famous for their futuristic approach and innovation. So these things matter. We chose only those brands which are proven and reliable. So we will advise you to compare brands, examine their products, check the quality they are offering and the features available before you buy a 3D pen in 2019. 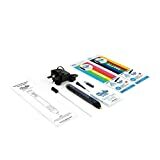 Check 3D Pen Reviews: Albeit words of mouth gives us a fair bit of idea about reputation of the product, it is not applicable in this case as most of the 3D pen users are first generation users. So before you buy a 3D printing pen, dig out the internet reviews, be aware of the marketing claims, read customer reviews and most importantly check whether those are fabricated or genuine. Plenty of 3D printing pen models made false promises, and boast of the features which are not included in the device. So go through the customer review on different shopping sites and also check the video reviews on YouTube. Only this way you can get an idea about the best 3D Pen you are willing to buy. Remember the modus operandi of a 3D pen is to create 3D drawings or object with it. So based on this concept, many brands launch their best 3D printing pens with differences in design or filaments. Owning an electric griddle pan may seem like a daunting task at first, but once you get used to it, we promise it will change the way you look at cooking. Whether you go for the standalone griddles on our list or opt for one of the all-in-one systems from Cuisinart or DeLonghi, you can experience the kind of versatility and freedom of cooking unlike what you have ever done before. By referring to our list of best electric griddles 201, you can find a lot of top electric griddles for sale. Otherwise, you may also want to buy one of these from your neighborhood supermarket, although you will often find the lowest prices online. Our list of the best rated electric griddles includes the best of the best, but if you have a favorite, don’t forget to let us know in the comments section.